When Rodney G. Gardner took over Mountain Alarm in Utah in 1974, he started Link Interactive, a subsidiary which today does business in all 50 states and sells its wireless home security systems through an exclusive agreement with Costco. Link Interactive’s focus is to keep its costs low by making all its home protection systems DIY installed. It has been recognized for excellence by the Better Business Bureau, receiving the BBB’s A+ rating. Alarm.com gave the company a 5-Star rating, and Service Magic bestowed its seal of approval, while CSAA certified Link Interactive as a Five Diamond Central Station. The Standard costs $30.99/month and comes with professional monitoring, 100% cellular, a 2-way voice-to-monitoring station, and intrusion, fire, crash & smash alarm. The Gold plan is available for $35.99/month and comes with everything the Standard plan comes with and includes life safety features such as smoke, fire, and CO detectors as well as home automation options such as online or app control, energy management, lights, locks, and thermostats. The Elite plan goes for $40.99/month and comes with all of the Gold plan features plus HD video monitoring which offers on-demand, scheduled, and motion-activated video recording. While an annual contract is required, Link Interactive gives you the choice to choose from a 12, 24, or 36-month commitment. All packages come with a 30-day 100% risk-free trial and come with a 3-year equipment warranty. With Link Interactive, all system components communicate with one another and with the control panel using Z-wave technology, which is just like Bluetooth. All Link Interactive plans come with the following: free expert tech support, 24/7/365 monitoring, redundant central stations, a 30-day money-back guarantee, phone, chat, & email support. If you’re moving to a new home and want to take your security system with you, you can do so free of charge. All you have to do is re-install your system and notify customer support, and the monitoring service will be activated at your new address. You can customize your home security system to meet your personal needs, all based on the control panel that communicates 24/7/365 via a dedicated cellular connection with Alarm.com’s monitoring center. Equipment is “crash and smash” protected, which means if someone tries to damage a component, the alarm is triggered. With their Go! Control alarm panel, you get an all-in-one security system with home management. Response time is advertised at 20 seconds or less between alarm activation and voice response by 2-way intercom from Alarm.com. Link Interactive’s app controls all system features remotely and is free. The app also alerts users to events, including severe weather events, while a complete history is also available. Use Link Interactive’s app for easy system control from wherever you are. Automatically lock up and secure your home and arm your system with just a tap of the finger. Along with the standards components, Link Interactive also offers a range of popular home automation equipment such as lights, locks, doorbell cameras, and garage door openers. Using Link Interactive’s various security systems are simple to use. DIY set up is also a breeze and generally will take between 30-45 minutes to set up, with the only tool required being a Phillips screwdriver required. With a touchscreen control panel and a keychain remote, it’s easy to activate the alarm system. Making things even easier is the mobile app that is available with the Gold and Elite plans. Link Interactive customer service is available Monday through Friday from 8am-10pm CST, and Saturday from 9 am- 6 pm CST. The customer service office is closed Sundays, but the central monitoring office keeps you safe by operating 24/7 every day of the year. Customer service has received an A+ rating with the Better Business Bureau (BBB) and is very responsive. It provides step-by-step guidance for all its customers on all DIY installation security packages to help troubleshoot. Phone service is available during business hours, 8am -10pm CST Monday through Friday, and Saturday 9am - 6pm CST. Online chat is available during business hours. There are video tutorials to help with DIY installations. The FAQ section answers a variety of question about all aspects of their system. There is a blog offering safety tips and checklists, although it was not updated at the time of this review. Link Interactive is designed to provide a quality product at a comfortable price. 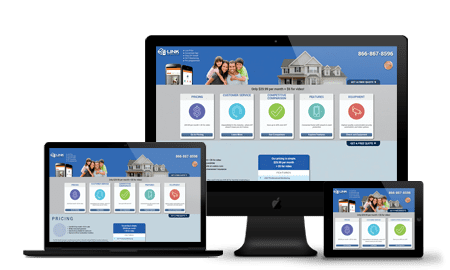 As a do-it-yourself home security system, Link Interactive enables you to easily install your customized security system, offering lots of guidance through the installation steps. The system arrives completely set up when delivered free of charge to your home. If you feel comfortable with performing minor home repairs, Link Interactive may just be the perfect choice for you.